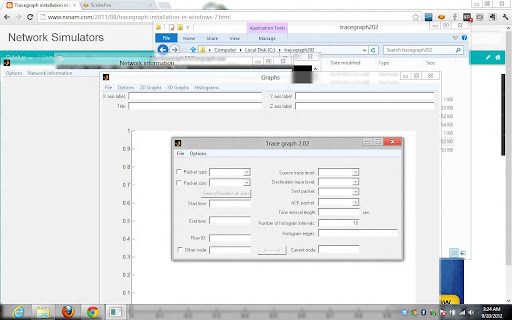 Tracegraph is a third party software helps in plotting the graphs for NS2 and other networking simulation softwares. But the sad point is the software is not maintained by anyone and the happiest point is the software works fine still and it is free. You may download the tracegraph software from these locations. 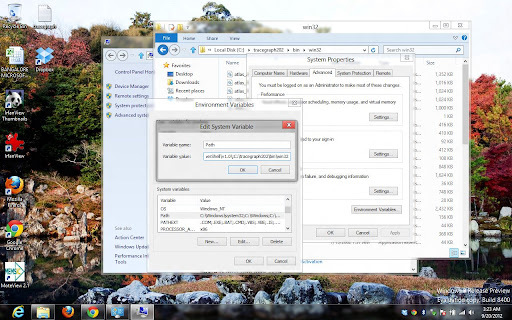 There are actually two files one with the matlab runtime library file and other is the original software tracegraph. Second window is the main window in which you can see the graphs for various performance characteristics like throughput, End to End Delay, jitter, etc in 2D and 3D facillity. Even it can plot the histograms too. Third window is nothing but the Simulation Information Windows, that you can see the packet loss, packet delivery, end to end delay for the total network, information about the intermediate nodes, source and destination nodes. I have installed tracegraph202 version on fedora17 but the GUI is not loading properly. I got downloaded mglinstaller.exe of size 8.31 mb from web but its not installing on windows xp and windows 7.